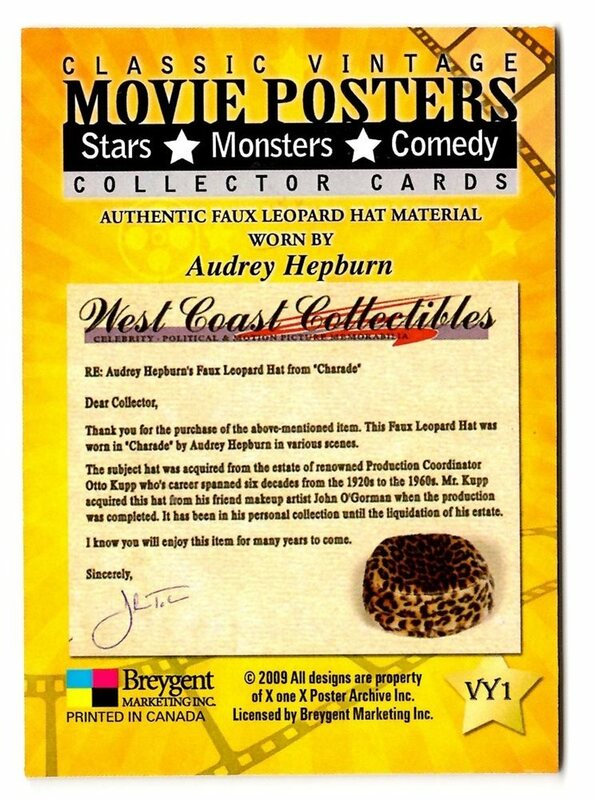 The auction house’s accompanying promotional video for the upcoming event doesn’t display much Charadiana, surprising no one, but near the bottom of the press release a very small amount of “film memorabilia” is mentioned. It’s difficult to tell if one should infer from this delayed placement that Christie’s, while enjoying the borrowed splendor of the late actress, would prefer to not sully itself with such things as movie props and other pop cultural ephemera. This is where one finds the item that The A.V. Club flagged up so prominently, Hepburn’s copy of the Tiffany’s screenplay, as well as the estimate of its anticipated value, between sixty thousand and eighty thousand pounds. And, no, that variance is not due to the soft market value of the pound sterling after last week’s special election failed to cement Theresa May’s or even the Tories’ mandate as leading parliamentary party. 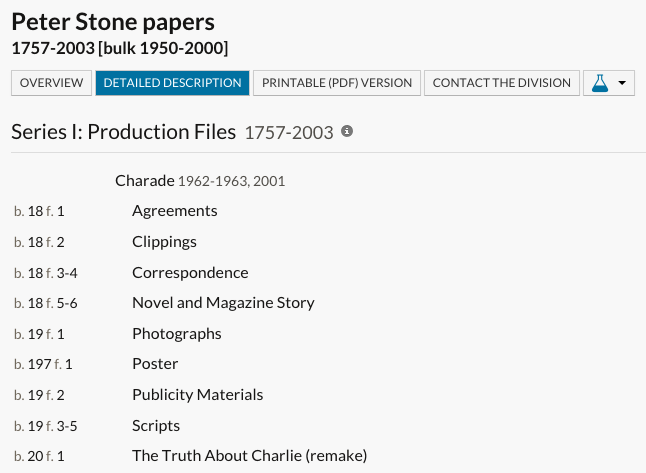 But tucked in next to that leading treasure is that Hepburn’s copy of Charade will also be for sale, expecting to rake in the comparatively paltry median amount of £20,000. For years, I’d wondered what my upper price limit on true Charade paraphernalia would be, given the chance to acquire some. After more than a decade of eBay searches, and having collected a showman’s manual and a variety of international contemporary promotional materials, it occurred to me that I’d never found a prop or costume from the film available for general sale. Despite surfing through the remnants of many liquidated estates of various autograph hounds and former Hollywood influencers, I’d never found anything that was a genuine Charade find. And while this wasn’t surprising, it meant that I’d never had to put my money where my mouth is in terms of being a self-professed Charade collector. Purchasing seventeen copies of the film on VHS, DVD, and Blu-Ray was one thing — literally, it’s just the one thing, in seventeen different reproduced editions of extremely variant quality — but how much would I be willing to spend on something substantially connected to either the production of the film or connected to its more famous players? 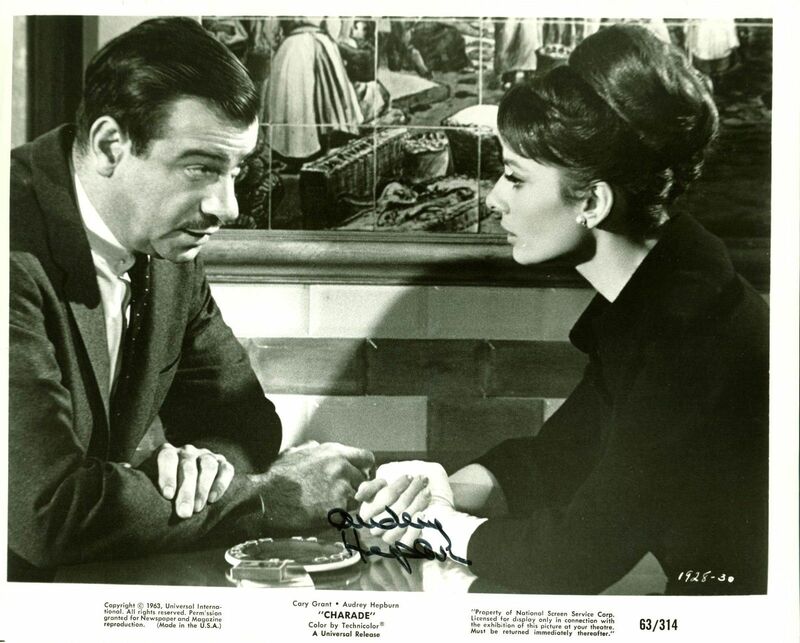 I got something close to my answer when an autographed still photograph from Charade made its way onto eBay. Photographs signed by Hepburn are infrequent but not nearly so few or so frequently snapped up as to be considered uncommon on the auction site. However, they are consistently glamour headshots, or images from My Fair Lady or Tiffany’s. This promotional two-shot still with Walter Matthau was literally the first autographed image of Charade I’d even seen, and it’s seller originally priced it at $1,400. It would occasionally fluctuate down to a more tempting $1,250 or so, but that was still legions beyond my modest willingness to accrue a proper, desirable Charade collection. It wasn’t just beyond my means, it kicked my efforts and aspirations into the realm of needing to ask myself: what was I doing with these items anyway? What did I hope to do with them, and would it truly matter to anyone else but me? And if no particular answer was forthcoming, could I, in good faith, spend that much money on something that had no larger purpose beyond simple acquisition? Perhaps the most authentic piece of memorabilia I have acquired is a well-aged copy of the issue of Redbook in which appeared the first published version of the story Peter Stone had reportedly failed to successfully mount as a screenplay. I have grand plans of one day sitting down and doing a full analysis of the short story versus the published novel versus the screenplay, figuring out what are the stand-out qualities, features, and mutant lumps of each version of the story (my vague memory of the novel is that there is an extended flashback sequence of Charles and his wartime companions that is both distracting and leaden, but that may be embellishment or fabrication on the part of my brain). But that only cost me eighteen dollars plus shipping, and while it’s thrilling from the perspective of being able to try and trace false starts and therefore try and identify and isolate any quintessences of charm or alchemy that make the final product so successful in my eyes, it’s hardly invaluable. And I am hardly likely to be able to afford the Hepburn copy of the screenplay. It would be nice to look at it and see if there are any doodlings, grace notes, or marginalia that would also help me to glean what she brought to her performance and interpretation of the text. Absent purchasing the item itself, though, the best chance I would have would be any images in the auction catalogue, which — as it has yet to be published — might be a mildly expensive boondoggle of vain pre-ordering, or an exquisite continuing reminder of how I’m well out of my class in terms of my collecting aspirations. And then there’s which catalogue to buy: do I chance on the “expanded content and lot essays” of the premiere catalogue to provide me with juicy details of that which I will never have, let alone see in person, or do I go for the more streamlined edition in terms of detail, but which also enumerates the contents of the second online auction, which is the set of lots I might actually have a chance of acquiring? Who am I kidding; this is an extended post about acquiring things. I clearly have to buy both. Two folders of material based on the novel and short story, and three of various iterations of the script. While it’s completely unclear as to how many pages that represents, that’s surely a wealth of information about choices and changes, of tweaks and shifts and nips and tucks to move from inspiration to cumulative result. 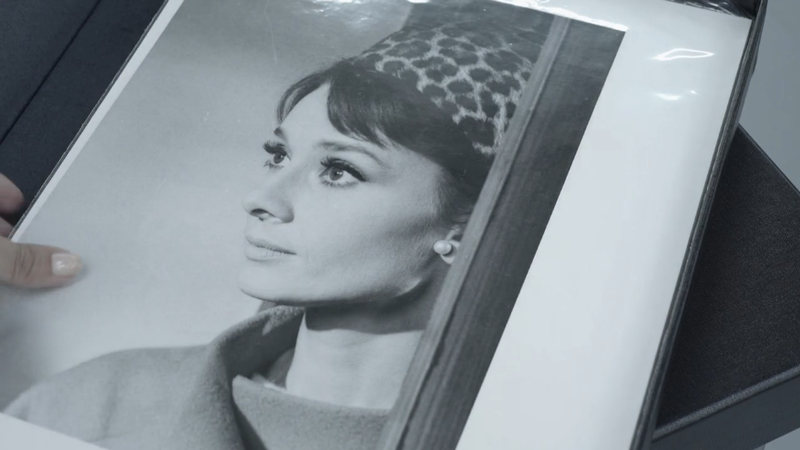 And, since promotional photos from the set have Stone at least partially on set during production, some of those changes may have been documented in situ and may be more reflective of the final process than any notes from Hepburn during preparation — providing, of course, that the script is an early draft and not a conurbation of dailies, updates, and add-ons accreted during filming. And, without a lot essay to specify, I really can’t know one way or another. What I do know is that it would seem that the public access afforded by the New York Public Library seems like a much more attainable field trip than a jaunt to King Street in London in late September.